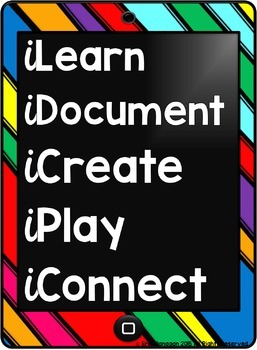 FREE iPad® mobile digital device Poster for classroom display, blogs, or social media. Download includes a high resolution 10x8 .png image file and a .pdf for your printing or digital uploading convenience. You may use this poster or image in your classroom or on your blog and other social media sites. You MAY NOT use this in commercial products or resell in anyway. A link back or credit to my store or blog www.erintegration.com is REQUIRED when using this image on social media, blogs, or websites online.